Hastings United Football Club will be aiming to spring a surprise when it hosts Crawley Town tonight (Monday). 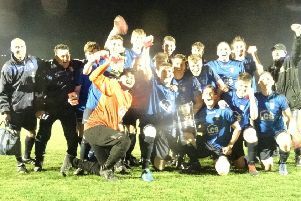 The Parafix Sussex Senior Challenge Cup third round tie is set to go ahead at the second attempt after being postponed due to the snow and ice laying on The Pilot Field pitch last Tuesday. The two teams will be bidding for a place in the quarter-finals of the county’s premier knockout competition and an away tie against Eastbourne Borough next month. Hastings have risen into the top half of Bostik League Division One South on the back of a nine-match unbeaten run in the league and 10 games in all competitions. After back-to-back postponements over the past week, Hastings will be playing for the first time in nine days, in a competition Chris Agutter is keen to do well in. Crawley’s priority is very much trying to move away from the lower reaches of Sky Bet League Two so their team is bound to look very different from that which lost 3-0 at Crewe Alexandra in the league on Saturday. Hastings will have happy memories of playing Crawley as the last time the teams met in the Sussex Senior Cup, they triumphed 2-1 away from home in November 2015. Sam Adams scored an extra-time winner on that occasion. Kick-off tonight is 7.45pm, and admission is £6 for adults and £3 for concessions.